KEF Provides ongoing support for various schools in the district, including Tloma Primary School. The Tloma Primary School is requesting $54,466 for the construction of a dining hall to serve 1000 children to include extending a nearby power line to the premises to provide electricity to the school. More information will be available soon. 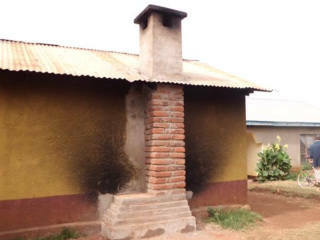 Some of the first projects at Tloma were a classroom, and new chimney for the Kitchen . KEF also has assisted with donating books, desks and chairs. KEF Tanzania board members, February 2012. TLOMA PRIMARY SCHOOL has more than 650 students. There are usually 3 or 4 children to one desk, and 4 children to one textbook. 45 children share one latrine. Needless to say there is a great need for additional facilities. Mr. Msuya, the headmaster, proposes that KEF helps to fund the building of additional classrooms, latrines and desks, to make learning more comfortable for children and teachers alike. The above needs do not apply only to Tloma Primary School. All the schools KEF has assessed are in dire need of these basic facilities – especially textbooks, desks and toilets. KEF has continuing projects with Tloma School from 2009-2018 we have our ongoing donate a desk program. In 2009, 2010 and 2011 KEF has been able to assist Tloma Primary School, Ganako Secondary School and the Karatu Ganako Library with the purchase of locally published school textbooks. Thank you to the Bellevue High Sch ool Leadership program for heading much of the textbook funding drive.